Claire suffered life threatening injuries in an industrial gas explosion in 2015 for which she required admission to intensive care. Her injuries included burns to 17% of her body, lacerations to her left arm and soft tissue damage, with muscle loss to her left thigh. Unstable cervical spinal fractures required emergency surgery. Facial burns and ongoing artificial ventilation meant Claire underwent the creation of a tracheostomy. A number of plastic surgical procedures were performed including skin grafting. Claire was referred to Osiris Health and presented initially with dry, raised and reddened scars. Additionally, there were areas of altered skin pigmentation and a very visible and tethered tracheostomy scar that was stuck to the windpipe. Claire also displayed contracting skin grafts to her left arm and an uneven thigh scar with a concave defect where the underlying muscle had been lost as a result of the explosion. The scars negatively affected Claire’s perception of herself. Her son’s friends commented on her skin grafts and she endured staring and comments particularly related to her tracheostomy scar. This caused her to feel obliged to explain her story, adding to her psychological stress. The tracheostomy scar moved up and down uncomfortably when swallowing and restricted Claire’s neck movement. Osiris Health liaised closely with her case management team and started Claire on a scar management programme 3 months after her injuries and have continued to provide ongoing, bespoke interventions to the present day. Treatments implemented by Osiris Health have included the use of targeted scar massage, stretching exercises, emollient creams, topical silicone products and skin camouflage. Surgical revision of Claire’s left thigh scar involved creating a flat, linear scar and, once this healed, transferring fat cells from her abdomen to her thigh to correct the contour defect. 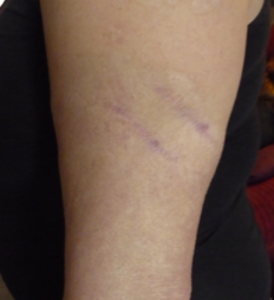 The contracted skin grafts to Claire’s left arm were removed and the skin edges brought together to create 2 smoother, less noticeable linear scars. 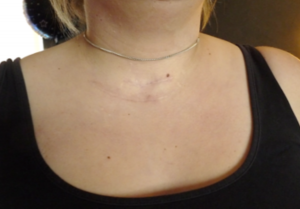 Claire’s tracheostomy scar required extensive release from the deeper tissues and the placement of an allographic biologically inert collagen scaffold to minimise the chance of future scar tethering during the post-operative healing process. Claire is very pleased with the results of her scar management. 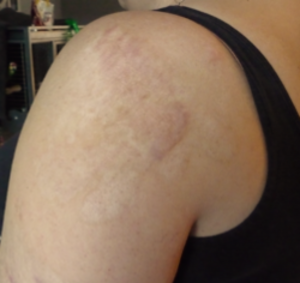 The photographic series below demonstrate the progression of her scars from early 2016 to January 2019. 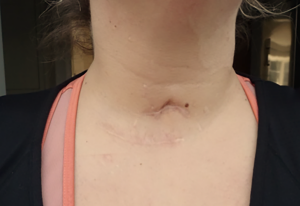 January 2016: 6 months after the explosion, significant tethering of the scar to the deeper tissues negatively affecting neck movements and swallowing and CT’s social confidence. March 18. 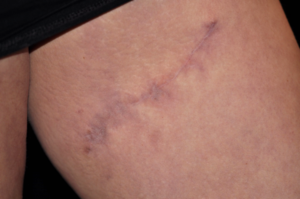 Before surgery: Scar has become slightly less tethered through tailored scar massage but remains very visible and restrictive. January 2019. 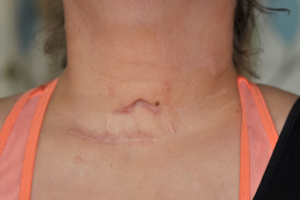 8 months after surgery: Release and revision of the tracheostomy scar has created a much less visible scar that will, over time, become more disguised by the natural neck creases. 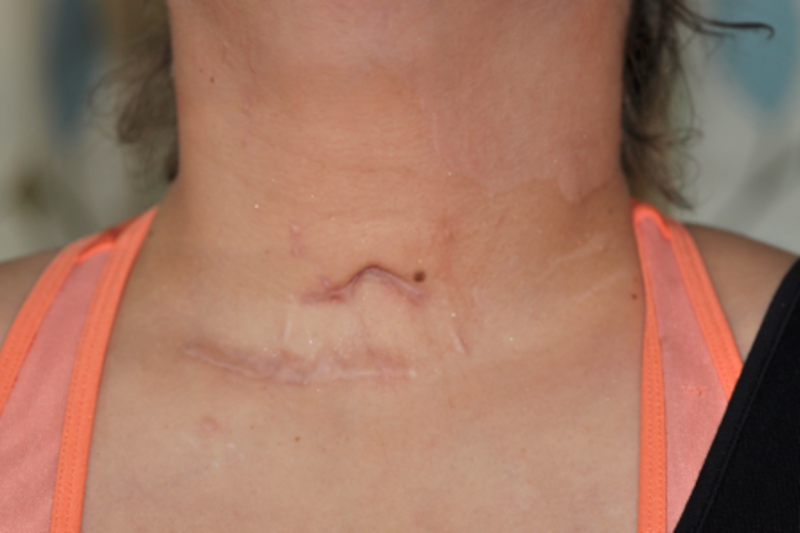 The scar does not now affect her neck movements or cause discomfort on swallowing. 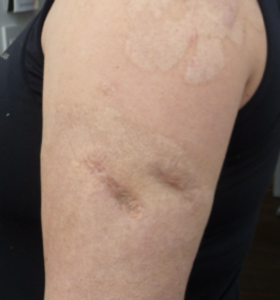 January 2016: Uneven scar with deeper tissue loss and discolouration. May 2017: Left thigh scar has responded well to conservative scar management including massage and silicone but the concave tissue loss and jagged scar line remain. September 2017: 3 weeks after surgery, a more linear scar has been created and deeper tissues surgically realigned to provide a more natural thigh contour. March 18: Before fat transfer procedure. The scar is well healed, supple and maturing but the contour defect remains visible hence the decision to transfer abdominal fat to the tissues beneath the scar. January 2019: 8 months after fat transfer. The linear scar is now half way through its maturation process – continuing to pale off. Improved contour to the inner thigh region seen because of the fat transfer procedure. January 2016: 2 deep lacerations to the left arm were closed surgically after the explosion using skin grafts. March 18. Before surgery: The skin grafts are mature but indented, conspicuous and make Claire self-conscious. January 2019. 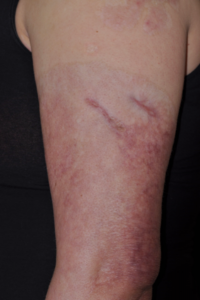 8 months after surgery: The original skin grafts were excised surgically and the skin edges stitched together to create narrower scars that are now flush with the contour of the rest of the arm. They will continue to pale as they mature over the next 18 months. January 2016: Left shoulder scar is raised, vascular and itchy. 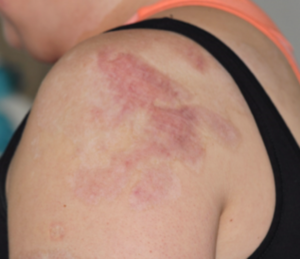 January 2019: 3 and half years after the index event – the use of scar massage and silicone therapy has encouraged reduced vascularity within the scar and improved the hydration of the skin and therefore reduced its irritability.